Shoreham boss Sammy Donnelly felt a few of his players 'didn't reach the standard' that his side normally aspires to in their 1-0 defeat against Broadbridge Heath in the Premier Division on Saturday. Picture by David Jeffery. 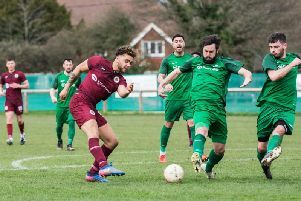 Shoreham boss Sammy Donnelly felt that some of his players didn’t ‘reach the standard’ that was expected of them in Saturday’s 1-0 home defeat against in-form Broadbridge Heath in the Premier Division on Saturday. Richard Wetton’s 67th minute strike ensured that the Bears took all three points, and left the Musselmen without a victory in three. Donnelly said: “As far as effort goes you couldn’t fault them. We just lacked that bit of quality that we had in the last few games. Somehow it’s gone missing a bit. “From now until the end of the season there will be games where we don’t get the result. The lads gave everything in defeat and you can’t ask for any more. Heath started the game on the front foot but Shoreham’s defence, and Musselmen ‘keeper James Broadbent in particular, kept the visitors at bay. On the stroke of half-time a through ball saw Broadbent out of his area and he collided with his own defender and Wetton. The Shoreham ‘keeper fell badly and was motionless for several minutes. The referee blew for half-time and fortunately the Musselmen stopper was able to return to the changing room and after treatment continued for the second half. Shoreham started the second half on the attack. A thunderous volley from Ryan McBride just missed the top corner and then a Musselmen header came back off the post. On 68 minutes Wetton dropped deep, picked up the ball 30-yards out and hammered the ball into the bottom corner to give Heath the lead. The game entered the last ten minutes and the Musslemen, with nothing to lose, started to throw more players forward. Heath had to negotiate a couple of corners and a 25-yard free kick before the final whistle blew. Donnelly added: “The effort was there and but we needed a bit of luck, which you always need and I don’t care what anyone says you do need luck. “We had two or three chances on Saturday where we could have equalised or gone ahead but it wasn’t to be. They did score a good goal and I think it was going to take a goal like that to decide who was going to win the game. Shoreham host Newhaven on Tuesday night, before travelling to Peacehaven & Telscombe on Saturday. Shoreham: Broadbent, Watts, Protto-Gates, Kirkwood, Bromage, Tuck, Myers, Rhodie, McBride, Fraser, Tuck. Subs: Mutungi, Firman.